Finer than silk are they. The name given above means 'A house of rushes' but the poet's real name was Michizane Sugawara; he was a great minister in the Emperor Uda's reign and a learned scholar; his works comprise twelve books of poetry and two hundred volumes of history; he was degraded in A.D. 901, and died two years later, an exile in Kinshū, aged fifty-nine. He is worshipped as Tenjin Sama, the God of Calligraphy, and is a favourite deity with schoolboys. Nusa are strips of coloured silk or cloth inscribed with prayers, which were presented at temples in the old days. Tamuke-yama no Hachiman, a temple at Nara, is the scene of this verse; it is famous for its maple leaves, and the poet intended to say, that the crimson colour of its own maples was finer than any brocade that he could offer. 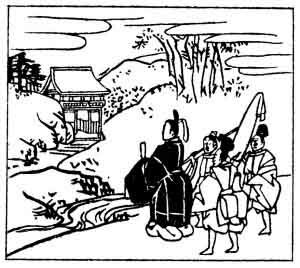 Another allusion is, that Tamuke-yama, near Nara, means 'The Hill of Offerings'.